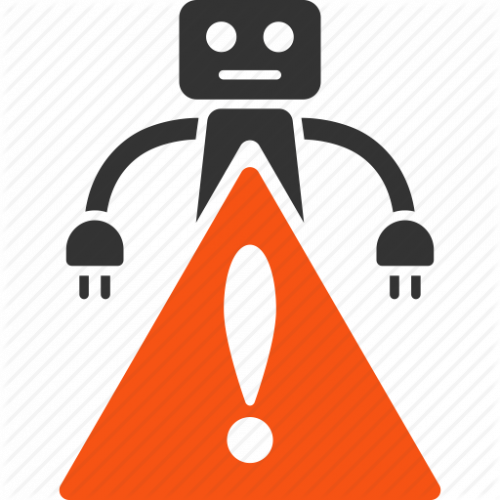 RoboAlert will send Alerts to a user in a number of different ways based on events in game. This plugin allows for the user to be away from their computer OR even have the game running in the background. This in return can lessen your chances of being banned.. I have tested RoboAlert on the below game versions. I am sure it works in other versions, but below are what I have tested. I have not tested all versions of the game. If you would like to test the plugin on a version of the game that I have not tested listed above, message me and I'll give you a free copy! Note that this only captures custom emotes (/e hi) in some versions of the game. Blacklist certain players so that alerts are not triggered from them. 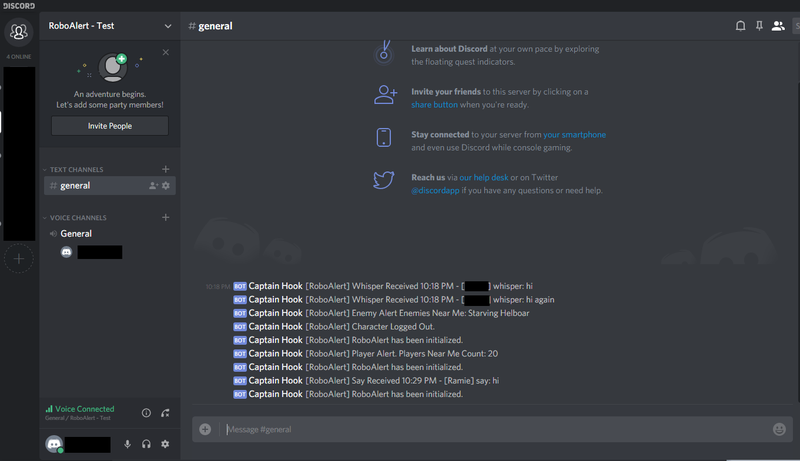 Send Discord Messages for any Alert Type. Pause WRobot when an alert occurs. Log Alerts to text file. Customization for Noise for All Alerts! All features can be turned on/off in Plugin Settings. Demo version of RoboAlert includes only Death Alert. 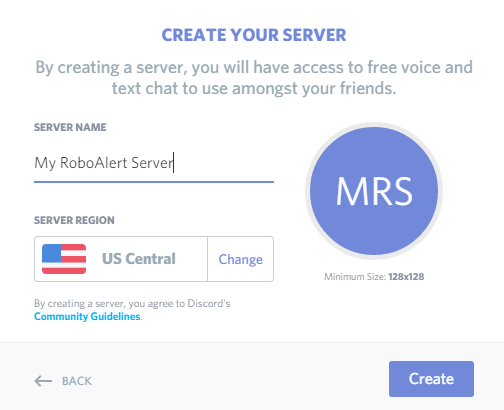 RoboAlert can send Discord messages based on configured events. Select the New Server button. It is shaped like a plus on the left side of the application (+). Enter a name for your Discord Server. Click the Settings Button of the General channel. Click Webhooks on the Settings Page and select the Create Webhook button. Enter a Name for the webhook, and then COPY the Webhook URL. 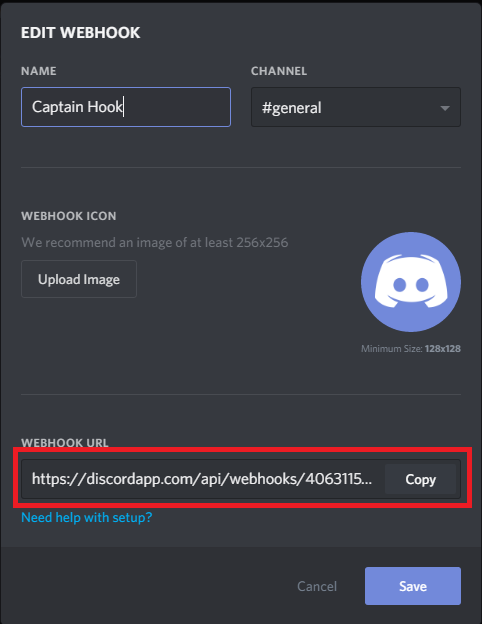 Paste Webhook URL into WRobot RoboAlert settings Discord Webhook URL field. RoboAlert can send Phone Notifications through Pushbullet based on configured events. Paste Access token into WRobot RoboAlert settings Pushbullet API KEY field. 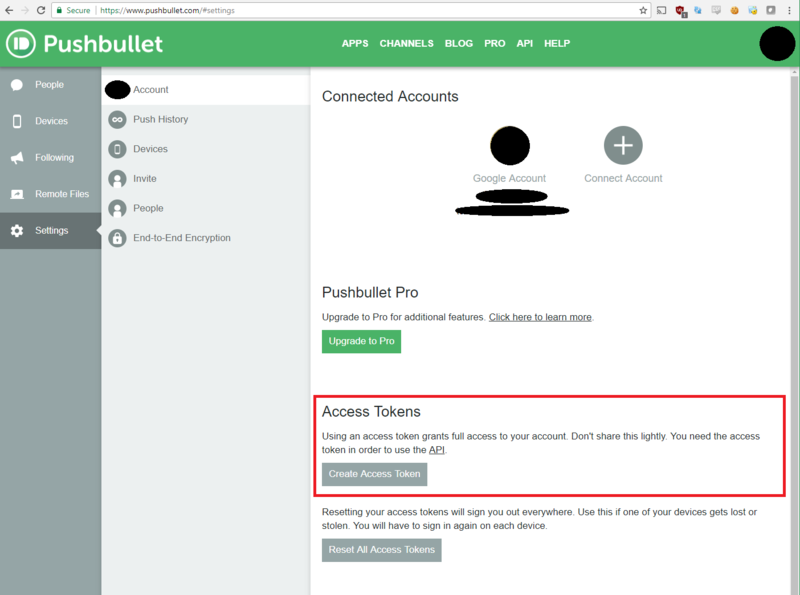 Do not share your Pushbullet token with anyone. Current Default Sound files used for Whisper, Say, Logout, and Death Alerts. As Noted above, sound files that are used to Alert user can be changed. RoboAlert can send emails based on configured events. Do not be worried. Droidz has confirmed this file and knows that I am not stealing your account details. [Logout] alert received: Character was logged out. This plugin allows for the user to be away from their computer OR even have the game running in the background. If any alert occurs, the user can respond accordingly. This allows for you to respond and lessen chances of being banned. I am always looking for ways to improve and or include more features. If you have any ideas, please feel free to leave a comment! Thanks! 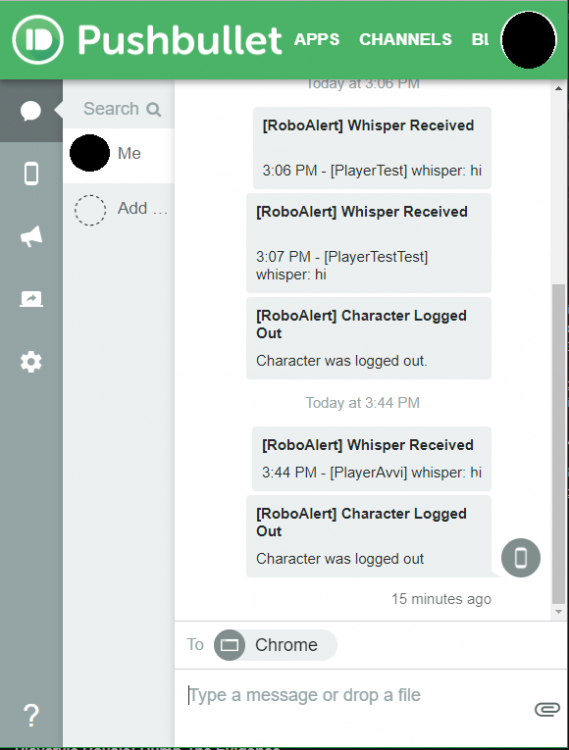 For any user that has previously bought RoboAlert and would like to buy RoboXecute for two way communication into WoW from discord and other in-game actions, message me with your Sellfy/Paypal email address for a 35% discount on the RoboXecute plugin. Server Hopper: Farm Gold more efficiently! New Alert for Character Logout. Bug fixed for when logging out and getting a 'Character' died alert. (1.3.2) Fix for Battle.Net messages not being a valid message type. (1.5) Added Text file logging for all alerts (can be turned off). Say Alerts and Whisper alerts show in email together if from same player. 10:05 PM - [PlayerName] whisper: can you help? 10:06 PM - [PlayerName] say: Thanks for helping! (1.7) Categorized Plugin Settings menu. (1.8) Alert on players nearby. A threshold and range can be set so that alerts are only made if X number players are within range. A minimum distance can be set. Default is 450, as that is what WRobot uses for detecing Teleport in 'Log Out on Teleport' settings. Teleport Alert can be caused by Continent Change, if turned on in Plugin settings. (2.01) Defect fix for subsequent Whispers/Says causing Pushbullet to not send a notification. (2.02) Implemented fix for Logout alert occurring when it shouldn't be (hopefully this resolves it, I will need feedback). (2.10) Added Enemy Alert. Create alerts for when an enemy with a specific name is nearby (Rare mobs for example). Thanks to @ufeeboy for the suggestion! (2.11) Enemy Scan range is now configurable in plugin settings. (2.20) Added Pause on Alert. We can now pause WRobot when an alert occurs. Thanks to @Zerouser for the suggestion! (2.21) Fix for Death Alert Spam. Player Alert now doesn't sound if we are in State of GoToTown. (2.22) Wait 30 seconds after completing ToTown state before publishing Player Alerts. (2.23) Wait 30 seconds wasn't always occurring. (2.24) PlayerAlert will no longer occur if character is Dead. (3.00) Alerts can now be sent to Discord! Thanks to @tonycali for the suggestion. (3.10) Added Node Alert. Create alerts for when an node with a specific name is nearby (Rare mobs for example). Thanks to @CocoChanel for the suggestion! (3.20) Limit Whisper Alerts for specific players. Also added the ability to exit game on Whisper Alert. Note: Emote Alert only works for custom alerts in some versions of the game. Ignore Whisper/Yell/Emote/Say/Players Nearby Alerts for a specific list of Players. (3.41) Fix for Teleport Alert failing when sending Discord message. Thanks to (@Radoi for pointing out the issue). And if you're worried about it "stealing" your password, it doesn't. You can clearly see it doesn't from the .cs file provided. Excellent plugin. Allows me to work while I play so I don't need to pay full attention to the bot. 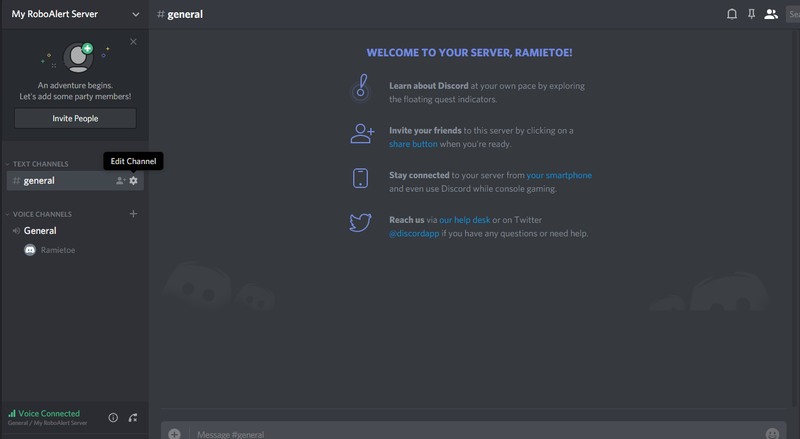 I personally used the discord functionality and I can definitely recommend. It will help you know what happens around your bot. Did someone just /say or /whisper something to you? No problem, RoboAlert got your back! On top of that you will know when there are players around, when they /yell, etc. Combine RoboAlert with RoboXecute and your botting days will be *much* easier! This thing is amazing! The Pushbullet feature is what I use it for. Cuts down on players reporting you which makes it well worth the money. Author is very kind and attentive and will contact you, if you report bugs or suggestions, and get them to work! Must-have for a private server, especially if you have little bot-farm and more! Does what it says really great plugin if possible would like to see if its possible to send the alerts to a discord channel since alot of us spend most of are time there but if not its ok as is. Really useful and more convenient now since it supports Pushbullet. If you're worried or you don't want to set your password in the plugin, you can just use pushbullet. I recommend this plugin to those who are looking for a way to get prompt notification on useful info like "Player Nearby", "Teleport" or "Character Died". I just left the bot open with this plugin and only check it when I get specific notification on my phone. Avvi is very active in fixing bugs and you can also request features if you want one.